- Professor Hans Holzer, PhD. on many TV and radio shows. Purchase a Phone Session with Marisa through PayPal. How can this power be used? Paranormal activity and ability has fascinated humankind since the beginning of time. As the world has evolved, so has our understanding and acceptance that some gifted individuals are able to see beyond the confines placed on most people. The arenas of science, law, medicine and even the military, have embraced this new frontier. We have progressed from denying the possibility to believing in the potential - and from researching to utilizing these abilities. Now experts are asking "How else can this power be used?" Born with the innate ability to see beyond what most of us experience, Marisa Anderson is able to envision events of the past and use the information to affect the present and future. Her advanced, emotionally intuitive method of problem solving has positively affected countless lives. 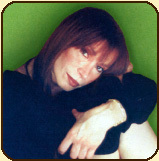 Marisa has gained recognition worldwide for her work with criminal cases, exacting world predictions and resolution of anomalous phenomena, better known as hauntings. Be Strong - abuse is not just physical! Get injuries medically documented but start with a call. Call the National Violence Emergency Talk Line directly at 1-800-799-SAFE.